What is the ACCRINT Function? The ACCRINT Function is a Financial functionFunctionsList of the most important Excel functions for financial analysts. This cheat sheet covers 100s of functions that are critical to know as an Excel analyst. The function will calculate the accrued interest for a security that pays interest on a periodic basis. 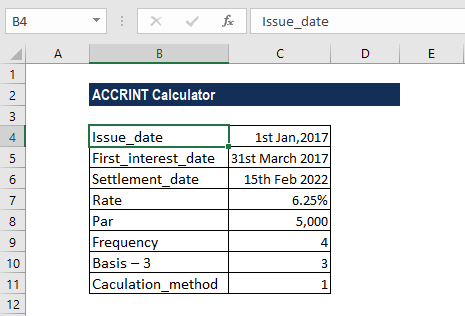 ACCRINT helps users calculate the accrued interest on a security, generally a bond, when that bond is sold or is transferred to a new owner on a date other than the issue date or on a date that is an interest payment date. 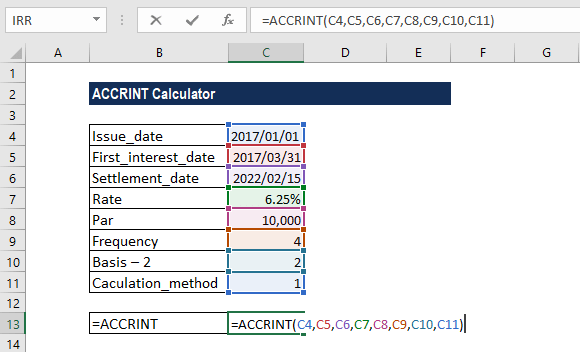 The ACCRINT function was introduced in MS Excel 2007 and hence is not available in earlier versions. Issue (required argument) – It is the security’s issue date. First_interest (required argument) – It is the first interest date of the security. Settlement (required argument) – It is the security’s settlement date. It is the date after the issue date when the security is traded to the buyer. Rate (required argument) – It is the security’s annual coupon rate. Par (required argument) – It is the security’s par value. If omitted by the user, the function will take the par value as $1,000. Frequency (required argument) – It is the number of coupons payments per year. The function will take for annual payments, frequency = 1; for semiannual, frequency = 2; for quarterly, frequency = 4. 8. Calc_method (optional argument) – It is either 0 (calculates the accrued interest from first_interest_date to settlement_date) or 1 (calculates the accrued interest from issue_date to settlement_date). 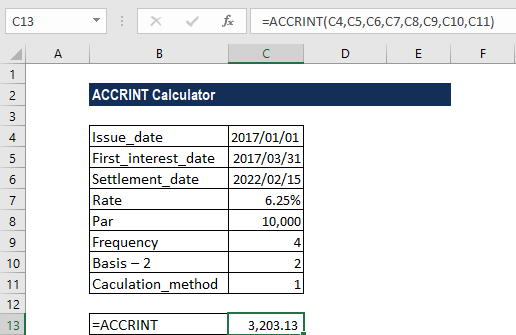 How to use the ACCRINT Function in Excel? The result we got is $3,203.13, which is the interest on maturity that we will receive. Ai is the number of accrued days for the ith quasi-coupon period within the odd period. NC is the number of quasi-coupon periods that fit in the odd period. Fraction is raised it to the next whole number. NLi is the normal length in days of the quasi-coupon period within the odd period. The given rate argument is ≤ 0 or the provided [par] argument is ≤ 0. The given frequency argument is not equal to 1, 2 or 4. We provided issue ≥ settlement. The given basis argument is not equal to 0, 1, 2, 3 or 4. The given issue, first_interest, or settlement arguments are not valid dates. Any of the arguments provided is non-numeric. If we attempt to input these date arguments as text, Excel may incorrectly interpret them, due to different date systems or date interpretation settings.